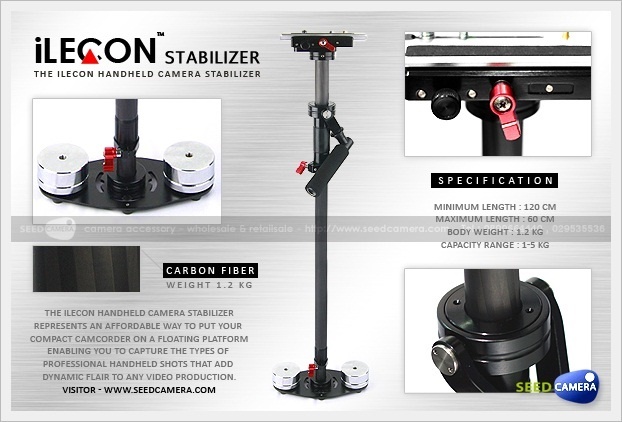 The iLecon Handheld Camera Stabilizer represents an affordable way to put your compact camcorder on a floating platform, enabling you to capture the types of professional handheld shots that add dynamic flair to any video production. Smooth camera movement that ranges freely in every dimension is not something you can achieve via dollies or shoulder-mount rigs. For truly unfettered, floating camera moves, you need a gimbal-based camera stabilizer. The design of the iLecon Handheld Camera Stabilizer is tool-free, so you'll be able to set up and achieve balance easily & quickly every time. With practice you'll be steering your camera through three dimensions naturally and smoothly without a second thought, as if the camera platform were a cloud floating through calm skies.